Choose Start→View Devices and Printers. The Devices and Printers window displays a list of installed printers and fax machines. 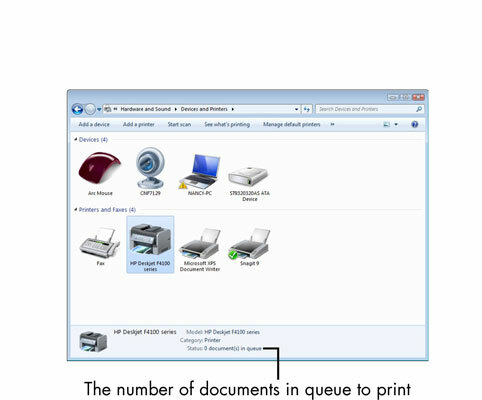 If a printer has documents in its print queue, the number of documents is listed at the bottom of the window. If you want more detail about the documents or want to cancel a print job, select the printer and click the See What’s Printing button at the top of the window. A list of documents appears. Click a document and choose Document→Cancel to stop the printing, if you want. To return to the Devices and Printers window, click the Close button. 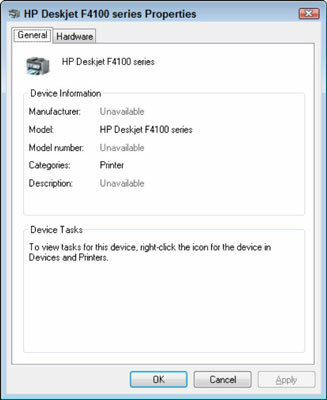 Right-click any printer and then choose Properties to see details about it. You see information such as which port it’s plugged into or whether it can print color copies. Click the Close button (the red X in the upper right). The Devices and Printers window closes.